Michelle Shores, RN, OCN, a nurse at Beebe Medical Center’s Tunnell Cancer Center, has earned her Oncology Nursing Certification (OCN), validating her knowledge and skills in working with cancer patients. This accomplishment also reflects her focus on offering quality care to the patients at the Tunnell Cancer Center. Michelle, a native of NewCastle, DE, moved to Lewes in 2006 and to a position as a certified nursing assistant at Beebe Medical Center. In 2007, she attended the Beebe School of Nursing, now the Margaret H. Rollins School of Nursing. In 2008, she did an externship at Tunnell Cancer Center where she fell in love with the cancer patients and their families. She graduated from the nursing school in 2009, and passed her boards to become a registered nurse. She then accepted a position at Tunnell Cancer Center. Since then, Michelle has filled many nursing roles there, working in several areas including, Radiation Oncology, the infusion center, and triage. Currently, 44% of the total number of nurses working at Tunnell Cancer Center have earned the Oncology Nurse Certification, or 17 nurses out of 39 total nurses. Of the clinical nurses, more than half have earned the designation. Tunnell Cancer Center was established in 1995. It has received the Commission on Cancer's highest accreditation with commendation as a comprehensive community cancer center. Its clinical specialties are medical oncology/hematology and radiation oncology. It also offers a multidisciplinary approach to cancer surgery. Nearly 300 patients visit the center each day. 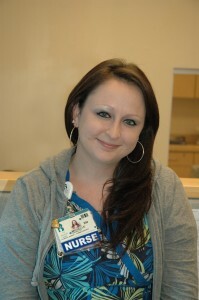 Caption: Michelle Shores recently earned the Oncology Nursing Certification.